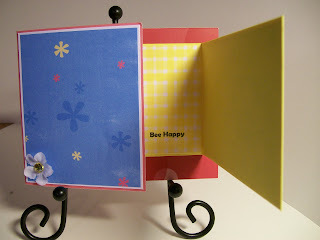 Make a JOY FOLD card. Please use a Squigglefly digital image. It must be a new creation! Joy Fold cards are such fun to make. 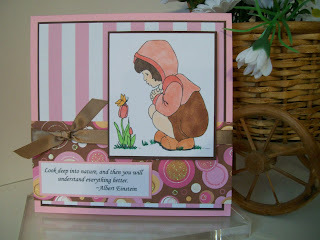 If you've never made one, you'll find a great tutorial here... and here are lots of examples. I generated the Bee Happy sentiment on my computer. I encourage all of you to join the challenge! For my card, I chose to go with sparkly glitter paper and pearls for bling. 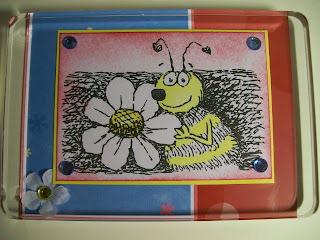 I also used a KLM Designs stamp set (it's one of the first acrylic stamp sets created by KLM Designs). This is a bittersweet post for me. It will be my last time posting as a member of the KLM Design Team. My tenure is finished and it is time for the new design team to show their stuff. It has been a joy to work with Kathryn, the owner of KLM Designs. I will treasure the memories. Thank you, Kathryn! 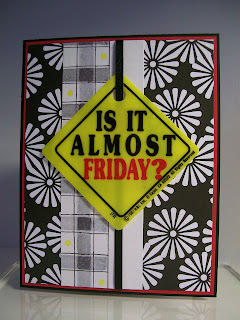 Instead of a challenge, this week SEW MANY CARDS is having a blog hop! Fun!!! Blog Hop Title: THREE'S A CHARM! And yes, there are THREE sponsors for the blog hop! 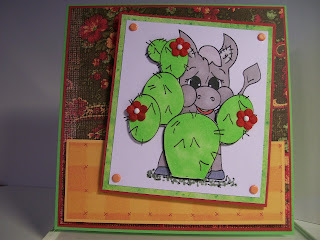 I wanted to make it look like the adorable little donkey really is behind the cactus, so I printed ot two images and created a layered look, with the cactus popped up off of the main image. 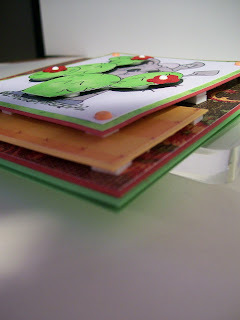 In fact, I popped two other layers, too, to give the card lots of dimension. 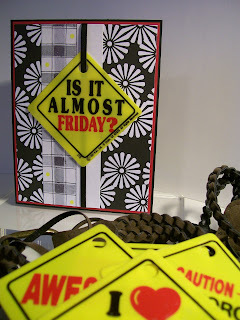 Speaking of which, it's time to send you on your way to the next blog on the Sew Many Cards THREE'S A CHARM Blog Hop. 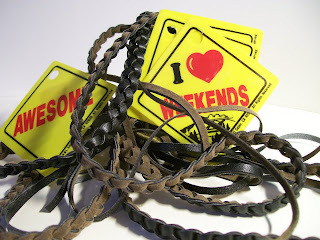 Hop on over to my online friend Lorie's blog and be prepared to be WOW'ed! She is AMAZING!!! Oh, and be sure to leave a comment along the way! The hunt was on last Friday... at the local yard sales! 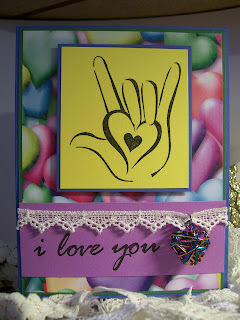 I was looking for unique, inexpensive, and fun items to use in my card-making. Truthfully, I didn't open the package of mini-signs so I didn't know what any of them said, other than the one that was on top (Caution... The force is with ME). I was super-duper excited when I got home and opened the package. 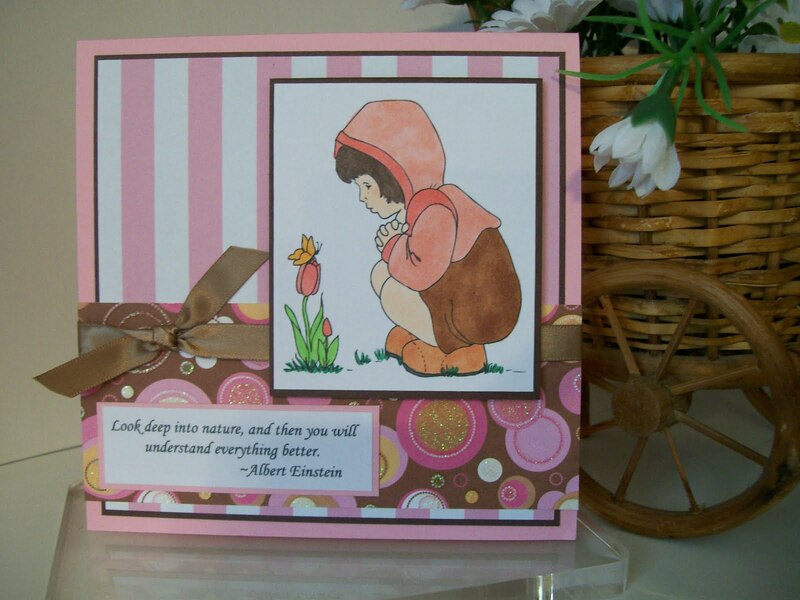 The one I used is sooooooooo appropriate for my dear daughter (who is the recipient of many of my cards). During her semester of student teaching (did I mention she went to college 630 miles from home?) every time we talked on the phone, she would ask: "Is it Friday yet?" It didn't matter if it was Monday, or Wednesday, or any other day, it was always the same question. Wouldn't this have been a perfect card to send to her?!?!? For the image, I wanted a lighter color, so I stamped it off one time on scrap paper before stamping on the piece I would be using. Flip Flops + Beach = Summer Fun! Oh the lazy relaxing days of summer! 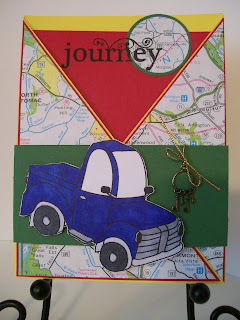 Lorie is the hostess of this month's Sisterhood of the Traveling Cards Swap. For the theme, she chose SUMMER! Oh, how I love summer! She made it really easy for us, too... NO rules. She said, Just have fun, and make sure that the creations reflect what YOUR favorite thing is about summer!! Oh my! That is wonderful!!! My card reflects two of my favorite things about summer. One (which I don't get to do very often at all since I live in northern Illinois) is to go to the beach. I'd love to be able to go every week - yet I don't even get to go every summer. Drats! There is just something peaceful and refreshing about walking along the beach and listening to the waves. 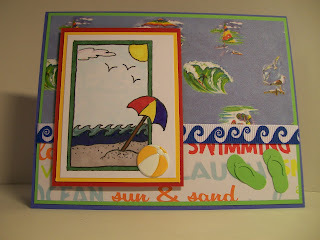 The other thing on my card that represents something I love about summer is the FLIP FLOPS! Yes, I love to wear them! I wear them every day it is warm enough to do so. Different Kind of Card Swap! I am very fortunate to be part of a 6-month swap on SCS. It's a different kind of swap. Each group has six members. A different group member prepares a kit each month and mails the kits out to her fellow-group members. The kits are identical. Group members create a card for each person in their group, using the kits provided. Joy was the hostess of our group this month. She sent bright pink designer paper, flower shapes punched out of what appears to be a book, and the TGF images. I added some inks, a striped designr paper, a brad, and cardstock. 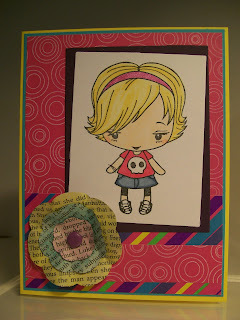 I colored the image with Copic markers and sponged Stampin' UP! ink onto the paper flowers. Thank you for a fun kit, Joy! 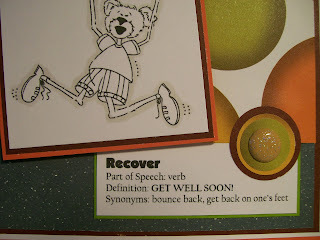 I decided to go with a non-conventional type of Get Well card. I chose a Squigglefly image that would rarely be considered for a Get Well Card. I created my own sentiment in word processing on my computer. To contribute to the Get Well theme, I chose not to color the main part of the image. Instead, I outlined it with a Warm Gray Copic marker. This gives the impression that the bear is not feeling quite like himself. I printed out a second copy of the image and colored the bouncing ball. I then carefully cut it out and popped it up off of the main image to give it some dimension. To provide some consistency with the circular designer paper, I punched out three different sizes of circles, layered them and added a sparkly brad. 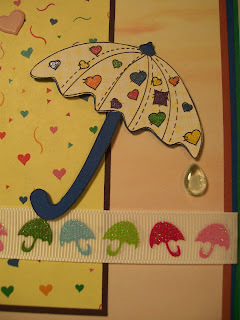 This unique embellishment was placed near the Get Well sentiment. NOTE: I have two blog posts today so please check them both out! Thanks!!! 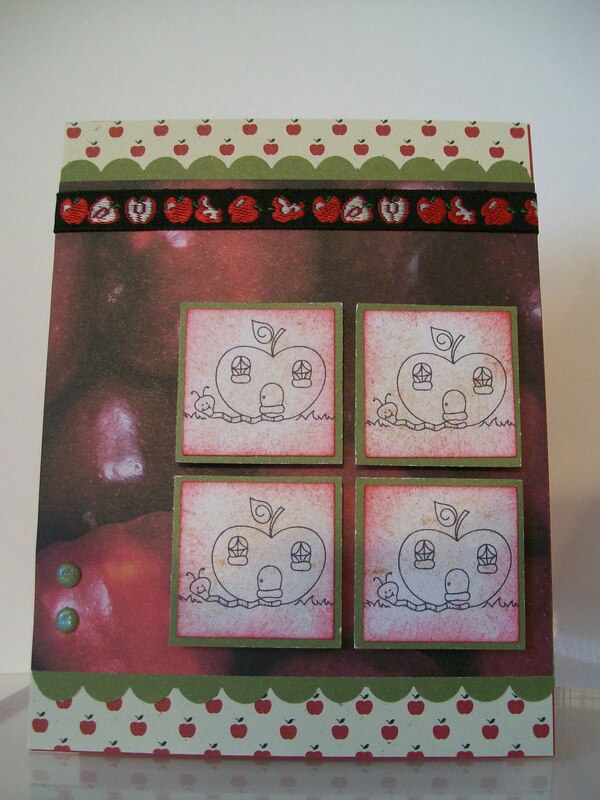 Sew Many Cards has incredible digital images and great challenges! This week's Sew Many Challenges continues to run through Thursday evening! In addition to the generous prize package being offered, Jodie Mackrell (the owner of Bugaboo Stamps) has also given the Sew Many Cards design team members (me!!) a digital stamp with which to create. THANK YOU, JODIE!!! The sentiment makes me laugh! Oh, and in case you didn't know... every Friday there is a new FREEBIE image posted (sometimes 2) in the Bugaboo Store! Be sure to check them out. Every Sunday there is a new Challenge posted on the Crafty Ho Challenge Blog. This week's challenge is a photo inspiration challenge. 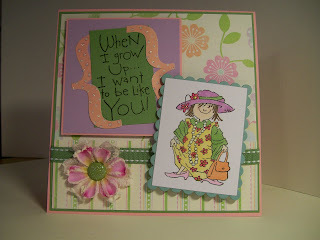 The photo (of a pink hat) can be seen on the Crafty Ho Challenge Blog. Saying you don't look good in a hat is like saying you don't look good in shoes! It's time for another challenge at Sew Many Challenges! This week it's ANYTHING GOES! You can find all the details for entering in the side column on the Sew Many Challenges blog, but for the Reader's Digest Condensed Version, create something (card, whatever) using a digital image no later than 11:59 p.m. on May 27 and post a link to your creation in Mr. Linky on the Sew Many Challenges blog. Simple, right? You don't have to use a Sew Many Cards image for the challenge, but there are some really awesome ones so you might want to! 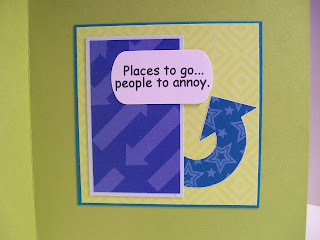 Check them out at the Sew Many Cards store! Every week, Sew Many Challenges has a sponsor who gives away a prize to a lucky participant! How cool is that?!?!? This week's sponsor is Bugaboo Stamps!!! Jodie Mackrell, the owner of Bugaboo Stamps has donated a generous prize package! That's an incredible prize package because Bugaboo has many many fun and creative images from which to choose! Isn't this an adorable image? I colored it with my Copic markers and added some silver mini brads for the buttons on little boy's overalls. Some designer papers and a fun button provide a colorful background. Anything goes... what will you create? It's time for another TREASURE HUNT Creation! Last weekend I ventured to yard sales in search of something to use in creating this week's Treasure Hunt Card. There were actually so many possibilities with the box of lace that it was a little overwhelming. 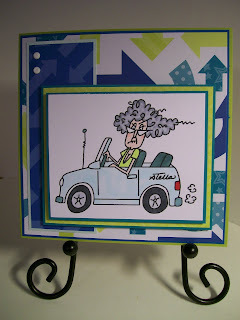 I used an old favorite stamp set to create my card - it is a Stampin' UP! set (long retired) called I Love You. 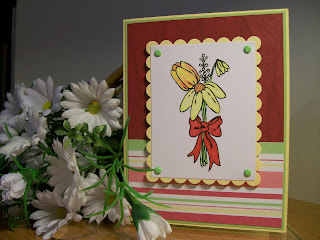 Today's creation is a simple Spring card, featuring a gorgeous bouquet of flowers. It is one of KLM's digital images, released just this month. I chose a mixture of bold colors and spring pastels for a striking color combination. I also went with a fairly symetrical layout, which is not my normal style. My sister has always loved horses. As a child, she dreamed of having a horse, so my parents bought her one. Granted, Billy wasn't much of a horse, but in her child-eyes, he was perfect. Now as an adult, she raises and trains horses as a hobby. Did I mention she loves horses? 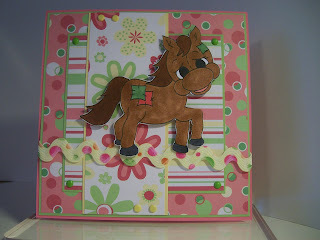 So, I'm always on the lookout for horse images/stamps to use in creating cards to mail to my sister. She's going to love Magick! There are so many adorable digital images at the Sew Many Cards store, there's truly something for everyone there, not just horse-lovers like my sister. Go check them out... and have fun shopping. Squigglefly has a new artist! Let's give a BIG WELCOME to Michelle Bertuzzi! 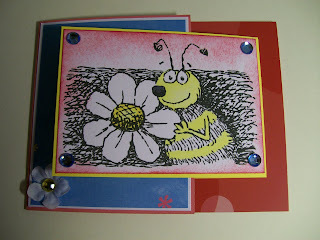 I decided to use one of her very first Squigglefly images to create my card for this week's Squigglefly Challenge. I hope you will play along in the challenge this week. NOTE: I have two blog posts today. 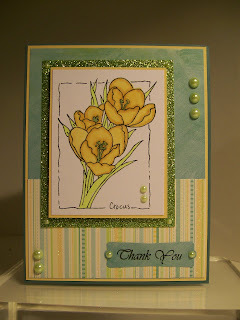 After viewing this Sew Many Cards Sponsor post, be sure to check out the next post, too. It's this month's KitCat creation. 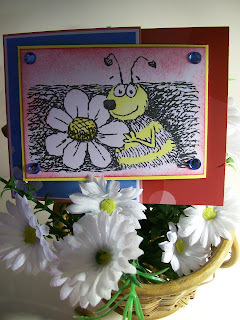 Sew Many Cards is proud to have Soft Pencil Digital Stamps as a sponsor for this week's Sew Many Challenge. The winner of this week's challenge will receive an awesome prize package from Soft Pencil! All the details for this week's challenge can be found on the Sew Many Challenges blog. In addition to the awesome prize package that Soft Pencil has generously donated, Elizabeth also provided digital images for the Sew Many Cards design team to use in creating a project. I was delighted to receive the Come to My Apple Home image. It features a cute little worm lounging outside an equally cute apple-shaped house. I actually printed out four of the images in a tiny format, so I could use them for this week's Crafty Ho's Sketch Challenge. I had some wonderful apple designer papers that worked perfectly with this Soft Pencil image. 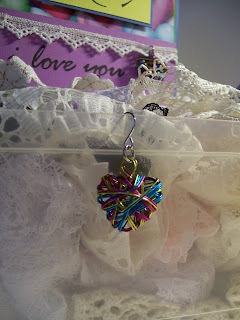 I also had some apple ribbon that I used as an embellishment. 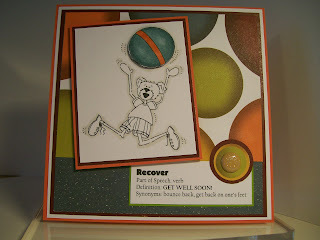 Instead of coloring the images (which would have been fun and adorable), I sponged Stampin' UP! Creamy Caramel ink all over them and then sponged Riding Hood Red ink on the edges. I punched them out with a Stampin' UP! 1 1/4" square punch. 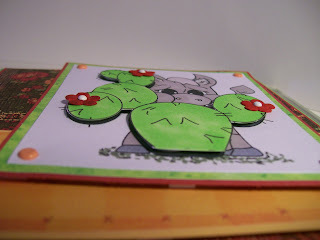 I layered the images on green cardstock, which I had punched using a Stampin' UP! 1 3/8" square punch. 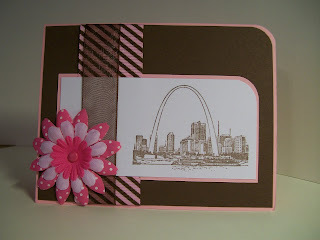 A couple of scalloped borders (punched with a Stampin' UP! punch) and a couple of green glittery brads completed the design. Argh Matey!!! It's KitCat Sunday! Please don't panic. I know the KitCat post is normally on the first Sunday of the month, but this month we're posting a couple of weeks later. Have you been wondering where we were??? Michelle is the hostess this month and my goodness, she sent us a marvelous package of goodies. We each received oodles of High Hopes images (with a pirate theme)! Argh! We also received Basic Grey designer papers galore, and buttons and brads, too, and a Rain Drop skull piece. This kit was just too fun. It definitely made me think outside the box. 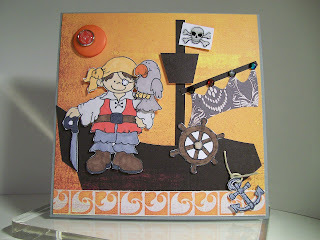 I decided to make a scene - a pirate scene, complete with a paper-pieced pirate ship. Now that the harsh reality of winter in the north is past, we are enjoying springlike temperatures, green grass (and the sound of lawnmowers, instead of snowblowers), and other delightful signs of the season. YIPPIEE!!! Perhaps that is why I like this KLM image so much. When I see the little girl gazing at the butterfly resting on the blooming flower, I am reminded that Spring is indeed here. It's Time for A New Challenge at Sew Many Cards! 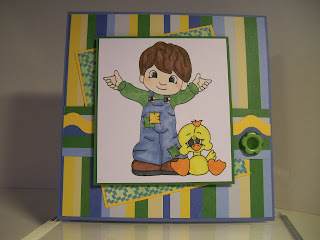 Easel cards are easy to make and lots of fun! The sponsor for this week's Sew Many Challenges is Soft Pencil Digital Stamps. 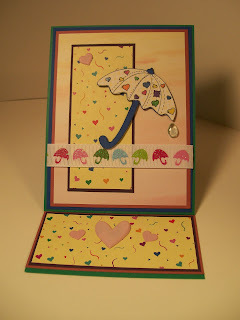 I used the Sew Many Cards Springtime Umbrella image. I used lots of layers of designer paper and cardstock to create a sturdy card that stands up well when propped in the easel position. 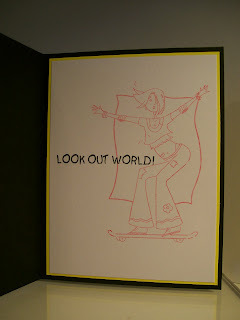 To create the image, I printed it out twice: once on a soft yellow plaid designer paper and once on blue cardstock. I colored the hearts and patch with a variety of colors of gel pens. Then I carefully cut out the images and glued the umbrella onto the frame. 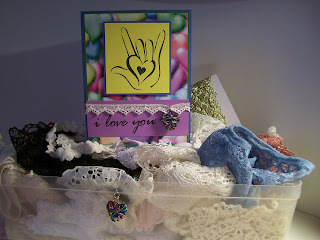 For embellishments, I used heart-shaped brads, in keeping with the design of the image. I also used a piece of ribbon that features glittery umbrellas and a single tear drop to create the illusion of a droplet of rain dripping off the edge of the umbrella. 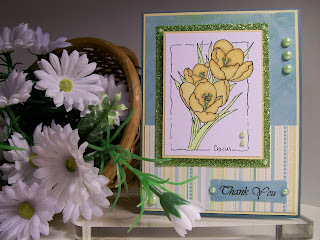 I'm looking forward to seeing your easel card, too, so be sure to play along in this week's Sew Many Challenges. Anybody Want to Go on a Road Trip?